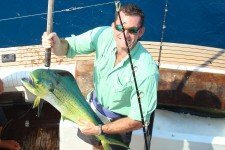 Port Canaveral & Cocoa Beach Fishing Charters - Offshore and Deep Sea Fishing Guide Near Port Canaveral and Cocoa Beach Florida Targeting Cobia, Kingfish. 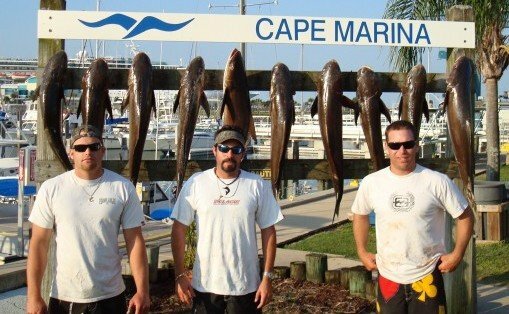 Near Orlando, Daytona Beach and Melbourne.Port Canaveral & Cocoa Beach Fishing Charters | Offshore and Deep Sea Fishing Guide Near Port Canaveral and Cocoa Beach Florida Targeting Cobia, Kingfish. Near Orlando, Daytona Beach and Melbourne. Tips for the Captain and Mate are appreciated. 15-20% is customary. Two great boats to choose from. All Ofishal Business charters are run out of a two boat fleet. Each boat is designed to maximize your opportunities to catch fish, and to insure your time on the water is comfortable and enjoyable. For longer offshore trips, Capt. Alex offers a 40′ Black Watch. Accommodating up to 6 passengers it comes complete with a galley, dining area, berthing area and head. This boat is designed to catch big fish in deeper waters while keeping it’s passengers safe, dry, and comfortable. For shorter day trips in near shore waters there’s a 32′ Stuart Angler that also accommodates up to 6 anglers. A full-time guide and fisherman in Port Canaveral. Capt. Alex Sorice (pictured center) is one of only a handful of full-time fishing guides fishing out of Port Canaveral. When he’s not running charters, he often fishes commercially providing fish for the retail fish market. It’s his many years of experience in both the commercial and charter fish industry that has made Capt. Alex an expert in fishing the near shore and offshore waters from Daytona Beach and Titusville, to Melbourne and Sebastian. With a two boat fleet, Capt. Alex often works in coordination with Capt. Kyle Larson, who is himself an experienced near shore and offshore guide. 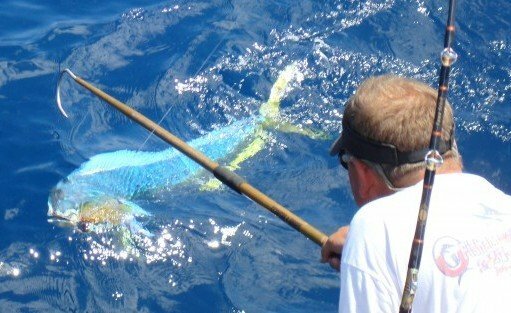 Offshore and deep sea guided fishing trips out of Port Canaveral & Cocoa Beach targeting dolphin, kingfish, grouper, cobia and more. Just minutes from Melbourne, Orlando, and Daytona FL. OFishal Business Charters offers a variety of chartered fishing trips for anglers of every experience and age. Our 4 hour near shore fishing charter targeting species such as Triple Tail, Cobia, Flounder, Snook and more. For those looking to venture off shore we offer full and half day trips for Dolphin, Wahoo, Cobia, Grouper, Snapper and more. We also have the ability with our 40′ Sport Fish to venture to the Other Side in search of large Yellow Fin Tuna, Blue Marlin and Giant Dolphin. For those looking to try their hand at a night Shark Trip we can bring you up close and personal with Jaws! The weather is starting to settle into a pattern where we are seeing a few good days a week. There is a good mixed bag of fish out there right now with some fat black fin tuna, King Mackerel and some Mahi’s mix with a few Sail Fish. The bottom bite is good with some trigger fish and a few vermilion and lane snapper mixed if you can get past the Red Snapper. The near shore trip has been seeing great numbers of big Bull Redfish although most are too big to keep they are a blast to catch! We still have a few dates over the holiday weekend open. Happy Thanksgiving! We are located in beautiful Port Canaveral, Florida. We’re a short 45 minute drive from Orlando, and less than 30 minutes from the cities of Melbourne, Titusville, and Cocoa Beach. 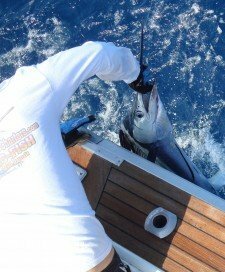 Fun, friendly, and relaxing offshore guided fishing trips are the specialty of OFishal Business Charters. 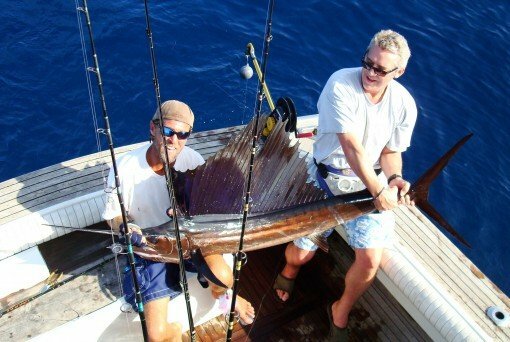 We offer a wide variety of Port Canaveral & Cocoa Beach fishing excursions, for a wide range of hefty, hard fighting, ocean sport fish, including dolphin (aka mahi mahi or dorado), cobia, grouper, kingfish, wahoo, snapper and much, much more. We also offer longer trips to the “Other Side” of the gulf stream in search of large Yellowfin tuna and blue marlin, as well as specialty trips to the Bahamas. 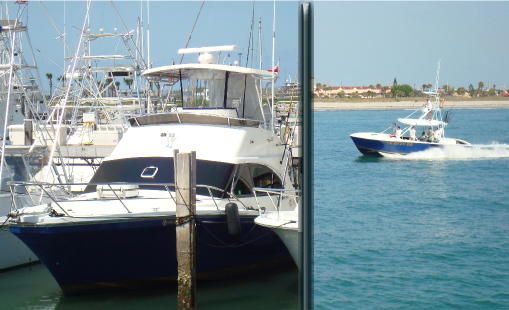 OFishal Business has two boats to choose from; our 40′ Black Watch “OFishal Business” which is an air conditioned custom Sport Fisherman and our 32′ Stuart Angler “OFishal Business II”. We fully cater to corporate clientele, experienced and novice anglers and especially to families. If you’re in Orlando for a work convention, an OFishal Business charter is a great way to build relationships with customers and reward employees. A Port Canaveral & Cocoa Beach fishing charter also makes for a great addition to your Daytona Beach or Orlando family vacation. And for you local residents of Melbourne, Cocoa Beach, and Titusville, an OFishal Business charter makes for a great weekend adventure. Learn more about our Port Canaveral & Cocoa Beach charter offerings and service locations. For your convenience you can check availability and reserve your Port Canaveral & Cocoa Beach Fishing Charters trip online. We also offer gift certificates that can be purchased online and delivered to your email on the day of your purchase. Please check the “Reservations” and “Gift Certificates” portion of this web site for more details.